In the early years of the last decade when the speed of the web aligned with the availability of high quality audio files, I went on a binge downloading all of the available Animal Collective live recordings from their page at the Live Music Archive and from various torrent sites. In 2007 I was finally able to see the band live. For the shows I recorded at Webster Hall shows that year, I had expected the band to play the live songs for which I was quite familiar, but those two historic Webster shows were heavy on new songs — my introduction to the material that would eventually become the band’s brilliant breakthrough album Merriweather Post Pavilion. I’m not so sure I was prepared for what would come next. When Animal Collective released MPP to overwhelmingly positive reviews, I recorded the first two shows in New York and the attention we received literally crashed the site. I learned a lot about the potential for this site to reach a large audience but also the mixed bag nature of viral material, and NYCTaper was forever inextricably intertwined with the music of Animal Collective. To this day, the recording for Animal Collective at Manhattan Center has been downloaded over 50,000 times and remains the most circulated of all of our recordings. In the intervening years, we’ve had intermittent opportunities to capture the band live including some memorable solo shows. There was the secret Glasslands show with Avey Tare and Deakin that introduced us to that amazing venue (RIP) and to the material that would eventually become Oddsac. Our recording of Panda Bear at Governor’s Island in 2010 was so successful that the artist actually released a limited version of the recording as a free bonus download with the album Tomboy. There was a pair of Deakin shows in 2010, a terrific solo show by Avey Tare at Knitting Factory in 2011, and then a full band show at Terminal 5 in 2012. But we’ve never quite captured the magic of the MPP shows and the rabid interest those 2009 recordings generated. Its now more than decade since my first obsession with Animal Collective and fortunately 2016 finds us both in very good places. The band’s new album is called Painting With and its quite an excellent piece of work and undoubtedly their strongest material since Merriweather Post Pavilion. The tour in support of the album is being played in smaller venues than anything since the small MPP shows and the feel of this tour is similar. There’s an excitement surrounding the band, the album and the shows that harkens back to 2009 and its a great feeling to have back. 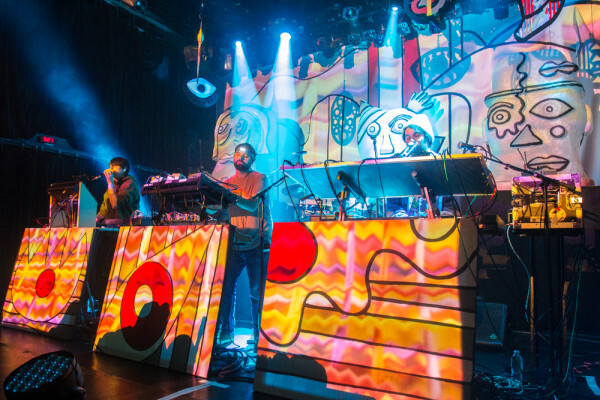 At Irving Plaza on Wednesday night, Animal Collective played a virtually flawless ninety-minute show that featured most of the new album, one bizarro cover, and several deep cuts from some of the earliest releases. Indeed, the final song of the night “Alvin Row” goes all the way back to the band’s first album, Spirit They’re Gone, Spirit They’ve Vanished. The venue was absolutely packed — I was pushed up against the soundboard cage for the entire night — but the crowd was entirely involved in the show. There is literally no yapping at all recognizable on this recording. And the band played off the energy coming from the crowd as this performance was top notch from start to finish. Indeed, the band only took two song breaks as they segued most of the songs from the main set, and the three encore songs flow as one. The current Animal Collective tour continues throughout the Spring, moving West and then spending much of April in Europe before the band returns to the US in May. There is a show on May 14 in Sayreville NJ that we are going to try to record, but our attendance is not yet confirmed. I recorded this set with my old Neumann KM-150 hypercardioids (the same mics as Bowery in 2009) from a prime position directly in front of the soundboard on the floor. The sound in the venue was phenomenal and this recording is quite superb. Enjoy! We have become fairly experienced and well-versed in covering band reunions from the 1980s and 1990s. Whether it be everything from the huge (i.e. Dinosaur Jr.) or the fairly obscure (i.e Cap’n Jazz), these get-togethers seem to follow a basic course — older and wiser forty-somethings re-connect with old friends to play the music that made them great in their youth to older fans who re-live the experience and younger fans who were too young to be there back in the day. Given the blessings of hindsight and sobriety, the formula has been quite successful. For the most part, the reunited bands are tight, more focused and seemingly more appreciative of the experience. The Babes In Toyland reunion had been brewing for a couple of years and began with an announcement that Kat Bjelland and Maureen Herman had begun writing songs together again. When the duo ultimately reunited with drummer Lori Barbero, the band played its first show together in 14 years in Los Angeles in February with a couple of tours to follow. The wrinkle in this reunion occurred at the end of the first leg of the tour when the band amicably split with bassist Herman, whose goodbye message to the fans is one of the classiest breakup announcements we’ve ever read. The good news about the Thursday Irving Plaza show arrived early in the week and that was the fact that the night was sold out. The crowd ended up being a nice mix of old punks and newer fans, but all of them brought the energy — the room was buzzing all night. New bassist Clara Salyer debuted with the band in late August and by Thursday, all three band members were truly in sync. Opening with a bang which never let up, Babes In Toyland worked through an hour-long set that touched on all of their original three albums, each song generating a sing-a-long from the crowd. We’re streaming “Oh Yeah!” and the single encore “Dust Cake Boy” which I believe were excellent versions of these songs, but really we could have streamed any song, as the show was that tight and well-played. This leg of the tour is complete, but the band will return next month for more shows on the East coast and the South. Yesterday, Babes in Toyland announced another upcoming NYC show — on October 23 at Saint Vitus. I recorded this set with the Schoeps cards mounted in the front center of the balcony and mixed with a superb board feed provided by the band’s FOH Rubes Harman. Our readers should be familiar with Rubes’ terrific mixes from some previous recordings at Baby’s All Right, and this mix is equally terrific. The result is that the sound quality is outstanding. Enjoy! If you Download this recording from nyctaper, we expect that you will PLEASE SUPPORT Babes In Toyland, visit their website, and purchase their official releases at your favorite retailer. There was a time earlier in this decade when Built To Spill made regular and frequent visits to NYC — from 2008-10, we recorded them ten times. But BTS has not appeared in New York in three full years, and they were clearly missed. 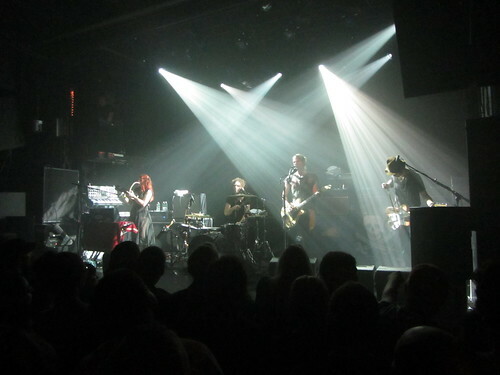 The crowd at Irving Plaza on Thursday night was animated and thoroughly packed into the venue. This might be the most crowded I’ve ever seen Irving, and I’ve been seeing shows there for 29 years. Built To Spill began the set in earnest with a ferocious ten-minute version of “Goin Against Your Mind”, and the energy never really let up. The band played a nice selection of material old and newer, and even included a brand new song “Living Zoo”, and the crowd was there with them throughout the lengthy set. Usually at a show this crowded, people tire of the sardine-like conditions and go to the back, but that never happened on this night. The place never thinned out, and when the encore segment began the audience was awarded for their effort. BTS has been played a series of interesting covers throughout the tour, including the Velvets “Sister Ray”. And although we curiously didn’t get the Lou Reed tribute in NYC, we did get a spot-on cover the Smiths classic “How Soon is Now”, which we’re streaming below. When the band left the stage, Doug Martsch said “see you next year, we hope”, so I expect it won’t be another three years before Built To Spill visit NYC. Meanwhile, BTS will be on tour for much of the next couple of months, dates [here]. I recorded this set with the Sennheiser Cards mounted at 12 feet from the middle of the floor. The sound quality reflects the sound in the venue that night, including a very noisy crowd. With that caveat, enjoy! If you email nyctaper for access to this recording, we expect that you will PLEASE SUPPORT Built To Spill, visit their website, and purchase their official releases from the Official Store at their website [HERE]. Just two days removed from the amazing for-the-ages Thee Oh Sees show at 285 Kent on Sunday, one would expect a let-down of sorts for the band’s Tuesday show at Irving Plaza. But Thee Oh Sees are not a band short on energy or seemingly in need of any particular motivation to deliver a crowd-pleasing garage-rock show. On Tuesday, the band worked through some technical problems throughout much of the show but continually rose above the issues to deliver song after song of high energy numbers. The venue was prepared in advance for the crowd and had installed a metal grating in front of the stage — the floor was completely maniacal, the band played off the crowd’s response. While 285 was the show of this tour, there were transcendent moments at Irving that reached the same peaks. We are streaming two of those highlights, “Tidal Wave” was three minutes of pure punk goodness, and “Dead Energy” was ten minutes of extended psychedelic jamming that rivaled any live band around these days. Thee Oh Sees have become one of today’s must-see live bands, and these two nights confirmed that we must not miss them whenever they’re in town. We recorded this set from a 12-foot stand in the middle of the floor. Both set of mics were mounted on the same stand inches away from each other. nyctaper used the Neumann TLM-102 large diaphragm cardioids and acidjack utilized Schoeps Cards. We believe the sound is representative of that in the venue that night, which had some issues. Overall, both sources offer slightly different takes on the same show and both are excellent. Enjoy! If you download this recording from NYCTaper, we expect that you will PLEASE SUPPORT Thee Oh Sees, visit their website, and purchase Floating Coffin from Castle Face Records [HERE]. I have consistently made the contention that Luther Dickinson is the best living guitarist. I’ve seen North Mississippi Allstars at least a half-dozen times, and on every occasion Luther has amazed with his ability to play authentic blues, honky tonk, rock, country and steel guitar. Luther even has a specialized guitar made from a coffee can. Sure, its the talent and precision that impresses but there’s also a indefinable soul to his playing. Last week, our most recent NMAS experience was at Irving Plaza for a nearly two-hour show part of the tour to ostensibly promote the newest NMAS album World Boogie Is Coming. The album continues the band’s output of sterling mix of American music. Its also the first album to feature the full-time contributions of Lightning Malcolm who has replaced Chris Chew as the full time touring bassist. But the show for me was really all about Luther’s guitar playing, and on this night as expected he did not disappoint. I recorded this set with the Sennheiser MKH-8040 cards mounted high in the middle of the floor. The sound in the venue was mixed quite well and we’re happy to present this excellent recording. Enjoy! This Recording is available to Download in FLAC and MP3 at Archive.org [HERE]. If you download this NYCTaper recording we expect that you will PLEASE SUPPORT North Mississippi Allstars, visit their website, and purchase World Boogie Is Coming and their other available releases through The Store at their website [HERE]. Futurebirds continue to broaden their audience and appeal, as the Athens, GA band refines their live sound and, of course, books opening slots with well-loved acts like the Heartless Bastards. When I caught them last year at Union Pool, the venue and the atmosphere gave the proceedings a more boozy, party-band vibe. That isn’t necessarily untrue of this Irving Plaza set – it was Halloween weekend, the band was the only one of the night’s acts to roll in with Halloween costumes, and the crowd was drinking plenty – but the bigger stage and sound system gave the band a more commanding presence. Here, their music had a bit more of an epic scope, so much so that they reminded me of a pedal steel-playing, more countrified version of fellow Southerners My Morning Jacket. The band, whose last record is a live album that documents the strength of their live sound, is using these Heartless Bastards shows to work out new material, and three of those as-yet-unnamed tunes were on offer on this night. Together with regular tour classics like their cover of Stevie Nicks’ “Wild Heart” and “Johnny Utah”, this show reaffirmed my view that we’ll be seeing more of Futurebirds in the years to come. I recorded this set with MBHO KA200N cardiod microphones from the center of the floor. Despite the challenges of the boomy room, with some TLC the recording is quite good. Enjoy! If you download this recording from NYCTaper, we expect that you will PLEASE SUPPORT Futurebirds, visit their Facebook page, and purchase Hampton’s Lullaby directly from Autumn Tone records (on CD or in any download format) here. In their nearly two decades as a band, The Dandy Warhols have done just about everything that musicians can do, in and outside of the music world. What continues to be refreshing about this band is there’s no “coast” in their vocabulary. Last month the Dandy Warhols released their eight studio album This Machine, which while it flew under the radar of most of the fad of the month publications, nevertheless continued to solidify the band’s catalog. When Pitchfork accused the Dandy Warhols of “going through the motions” we hoped that it was a knee-jerk reaction to a new album of a band nearing their second decade and from a publication known for mailing in agenda-fueled reviews. The album’s tour came to NYC this week and we caught the Irving Plaza show with a bit of trepidation. We expected that a band on autopilot would have performed an hour set with a few new songs mixed into the main set and the classics to close the show. Fortunately, the Dandy Warhols were just getting started at the hour point — a couple of band members actually took a bathroom break. Instead the band plowed through twenty-two songs that covered material from every single one of their albums. We are streaming the much-requested “Lou Weed” from their debut album. When the show ended with an extended version of “Boys Better”, the Dandy Warhols had played for two hours and barely came up for air. If this epic Irving Plaza show proved anything, its that Pitchfork is going through the motions and were both cynical and lazy in their assessment. The Dandy Warhols are as vital as ever. I recorded this set with the four microphone rig on the floor of the venue in front of the balcony overhang with the microphone stand up to 15 feet to avoid the floor chatter. The sound quality is excellent. Enjoy! If you email nyctaper for access to this recording, we expect that you will PLEASE SUPPORT The Dandy Warhols, visit their website, and purchase This Machine from the Store at their website [HERE] . Although known for their epic sets, including the several we recorded last year, Built to Spill’s set at Irving Plaza(thankfully renamed back from its brief, lame, “Fillmore East’ incarnation) was relatively short (clocking in around 80 minutes) and tighter than we expected. That said, the band tore it up for every second that they were onstage, and frontman Doug Martsch’s vocals were dialed-in from moment one. Playing very little of their recent There is No Enemy (though the leadoff of “Oh Yeah” was perfect), the band decided to play through the catalog, including an excellent version of their early classic, “Car” with the crowd fully behind it. The band also played a highlight from their Live album, the Halo Benders cover “Virginia Reel Around the Fountain.” The fact that a band’s 80-minute show is considered “short” is a testament to how much they normally give their fans. In the end, not every show – even one with a serious player like Martsch – needs to serve up non-stop jams to be a winner. We recorded this set from the center of the floor with the Schoeps and Neumann hypercardiod microphones parallel to each other on an 8-foot mic stand. With some EQ tweaks to reduce some of the room characteristics, the sound is excellent. Enjoy!